This fully automatic condensation pump is suitable for high-efficiency and gas-furnace condensate. It has a ½ gallon leakproof, rustproof, high impact ABS tank and is UL and CSA listed with thermal overload protection. A residential central air conditioning unit, humidifier, or gas furnace can produce up to a gallon of condensate an hour. Many times gravity can remove the condensate from the condensate pan but sometimes the distance it must travel or height it must rise to connect to the drain line is too great and a pump needs to be added. 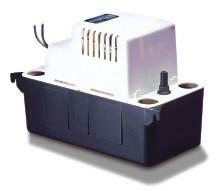 Condensate pumps kick on when their tank accumulates condensate to a level that raises the float switch and continues until the level of condensate is much lower.